I am at Leeds GovJam, helping run things. There are many great things about doing this. One of them is the most excellent company I get to keep helping out. It’s fun to talk design with those guys and gals. I don’t get much of that these days. At lunch Kathryn and I were talking shop. We got onto personas. We both agreed that personas are a starting point. Once you get testing your ideas with people personas should drift off into the sunset. 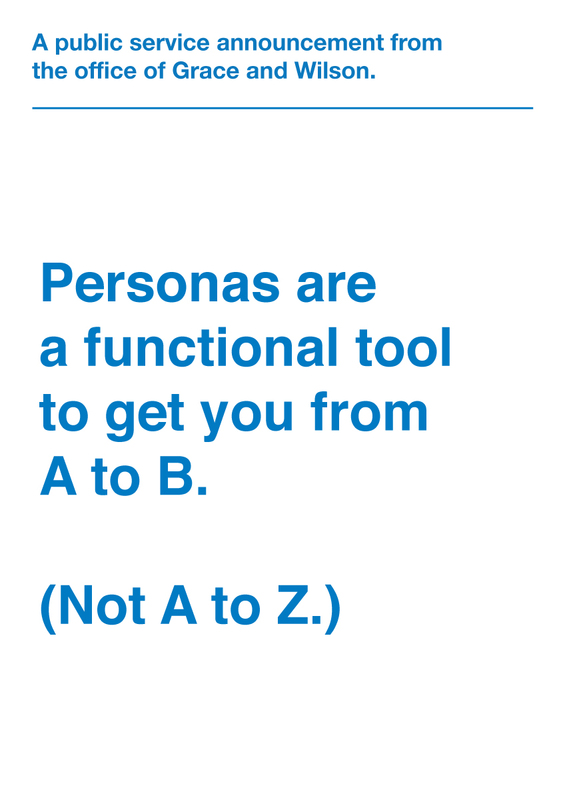 “Personas are a functional tool to get you from A to B,” said Kathryn. “Not A to Z,” I replied. 10 minutes later Illustrator was exporting the posterised version of that accidental slogan. Kathryn and I had “an office” as well. Y’know. Like Charles and Ray. It was a quick bit of fun. I am more writing this post for posterity. If you want it, here’s a PDF.